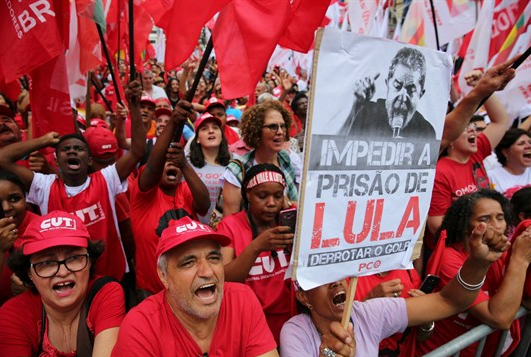 Brazil’s leftwing Worker’s Party (PT) who delivered the country’s presidents for the past decades, is struggling to get back up after the jailing of its most popular politician, former President Lula da Silva in April of this year for corruption. As the electoral court ruled last Friday that Mr da Silva was barred from participating in the October Presidential Elections, expectations were that he would assign his second in command, Mr Fernando Haddad, the former mayor of Sao Paolo, to lead the candidacy of the PT. However, the leftwing party was met with further scandal yesterday when corruption charges were also launched against Mr Haddad for accepting a $1 million bribe from construction company UTC Engenharia back in 2012. As the wheels of justice grind slowly, political analysts are convinced Mr Haddad’s potential candidacy is in little danger of also being blocked given that any trial is unlikely to take place before next month’s election, which will occur in two rounds. Related coverage: <a href="https://thegoldwater.com/news/35850-Brazil-Will-WhatsApp-Decide-Presidential-Election-Result"> Brazil - Will WhatsApp Decide Presidential Election Result?</a>. However, the charges could be used by rivals to undermine his campaign. Markets fear what they see as a nightmare scenario in which Mr Haddad runs against Mr Bolsonaro in the second round, forcing voters to choose between the old left, charged with corruption and the untested right. The PT claimed that the allegations were “surprising in an electoral period” and “without any proof”. Mr Paulo Teixeira, a senior parliamentary member from the PT, blamed Machiavellian forces at work intended to “help the campaign” of Mr Jair Bolsonaro. Of course, should the PT voters disperse amongst other candidates, this would only heighten the chances of Mr Bolsonaro, who currently leads polls at around 20% though most analysts agree his support is probably higher. As previous elections in Europe and the US show, the support for rightwing conservative candidates is mostly underestimated in polls as people do not dare admit they will vote for what some in the mainstream media call the ‘far-right’. Examples are the score of the FN in the first round of the 2017 presidential election in France and the score of the AfD in the 2017 federal elections in Germany.